Rupert is happy to present “Who is Nathan?”, a solo presentation by Phanos Kyriacou, bringing together works produced in Rupert during residency, and older works that the artist brought with him from Cyprus. Four clay and three terracotta pieces, picked up by the artist after being thrown out by the owners of a ceramic studio in Nicosia that has now closed down, are supported by custom-made steel structures produced locally. Whilst the steel structures support the pieces, the pieces in turn support the steel structures, with one piece in particular, a found wooden component operating as a handle. As one supports the other, the socio-historic taxonomies that normally separate the two, come to coexist with the artist’s newly articulated logic. 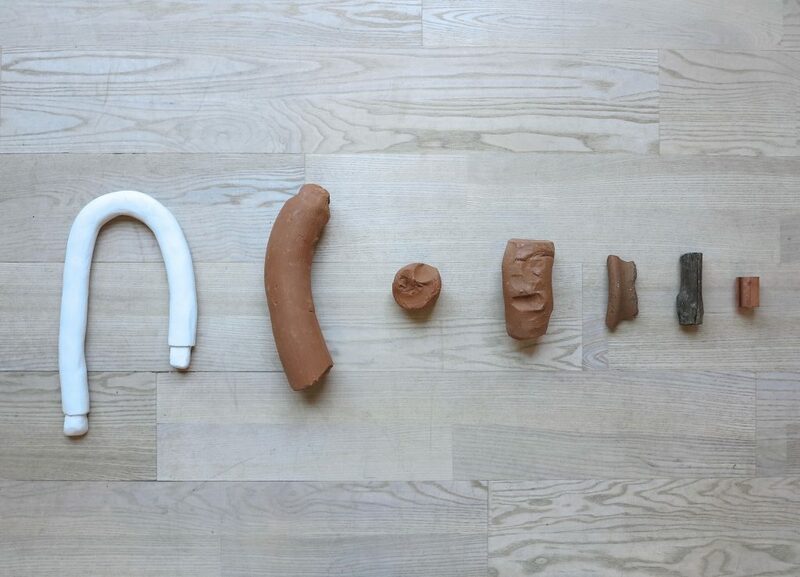 Within that logic, terracotta pieces are many things at once: remnants and referents of an expired past, talismanic objects, formal sculptural elements with physical and sensorial attributes and architectural components. Equally, the steel structures are both supports for found objects and sculptures, sculptures in themselves, architectural articulations and imagined gestures rendered concrete. In the middle of the room, there is a video of a dog breathing. We can only see her stomach as it waxes and wanes with each breath. We breath in and out with her as she sets the time for the exhibition in motion. The show opens on Saturday 19th of September in Rupert at 5 pm. We’ll be happy to see you there. Opening times: September 21st – October 2, Monday – Friday, 11 am – 5 pm. Phanos Kyriacou was born in Nicosia (1977), Cyprus and graduated from Middlesex School of Fine Arts (Quicksilver Place) in London. In 2007 he completed his MFA at Goldsmiths University of London and currently living and working in Nicosia. Kyriacou created ‘Midget Factory’ a project space in the old part of Nicosia in 2003 from where he carried out various projects that create a dialogue between his work and the urban landscape. He had a number of solo presentations including: 2015 “The Adventures of a Giant Midget,” Thkio Ppalies, Nicosia / 2014 “view to river from north,” Maccarone, New York / 2013 “Between a woman and a mountain,” The Temporary Museum, Nicosia, Cyprus / 2012 ‘Intimate long shot’ curated by Androulla Michael at Chypre Culture, Paris , ‘On corners On concrete On green pine wood Of man On standing’ at Kinderhook&Caracas ,Berlin / 2011 ‘Everyone should walk’ at Salon Populaire curated by Tanja Schomaker, Berlin, ‘On Handling Considered as one of the Fine Arts’ at Kreuzberg Pavilion, Berlin, ‘I am going to have to disappoint you’ curated by Lorenzo Sandoval, at Altes Finamzant, Berlin , Glimpses and observations at Glogauair Residency Program Berlin /2010 ‘It was an odd, almost unreal landscape, not without a certain beauty’ at Omikron Gallery, Nicosia / 2009 ‘Crash helmets must be removed’ at APOTHEKE / Nicosia. He has also participated in a large number of group exhibitions in Cyprus and abroad including: 2014 “Non-standard testimonials,” David Dale Gallery, Glasgow / 2013 Oo – The Cyprus / Lithuan Paviilion curated by Raimundas Malašauskas at the 55th Venice Biennale, Fusiform Gyrus curated by Raimundas Malašauskas at Lisson Gallery / 2012 “Blind spot” at the Grimm Museum curated by Silvia Ploner, Berlin, “Urban-A-Where curated by Socratis Stratis” at Casteliotissa, Nicosia, Mapping Cyprus – Contemporary Views curated by Androula Michael at Bozar, Brussels / 2011 “Terra MeIditerranea- In Crisis” curated by Yiannis Toumazis at NiMAC, Nicosia, “The location of culture”, curated by Pavlina Paraskevaidou at Pulchri Studio, The Netherlands / 2010 “Chypre 2010, L’art aupresent”, Espace Commines, Paris, France curated by Yiannis Toumazis &Andri Michael / 2009 “Synergia” with Angelos Makridis curated by Yiannis Toumazis at the Cyprus Archaeological Museum.